The TreadClimber is one of the most popular incline trainers offered by Bowflex. This versatile machine allows users to decide whether they would like to walk on an incline, train on the elliptical or climb. They are able to burn calories and get their bodies in shape better than they can with traditional treadmills, and there is no need for them to run. 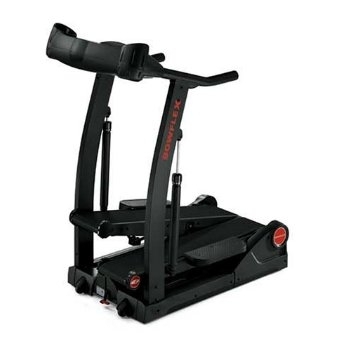 The TC 5000 is just one notch below the TC 5500, which is Bowflex’s five-star incline trainer. The Efficiency: When using an elliptical trainer such as this, people are able to see results faster than they would when using a typical treadmill. People are forced to exercise different muscles when using an incline trainer, and it burns far more calories than you would if you were exercising on a flatter surface. Saving Space: The TC 5000 is 46×30, which is smaller than a standard treadmill. This is a definite plus for those who have a limited amount of space. It is fitted with wheels, which makes it very easy to transport. Programs: The programs that are included with this device have 12 different levels of intensity. Motor: You can go as fast a four miles per hour when using this machine. Comfort: TreadClimbers were created for people who prefer low-impact workouts. Assembly: You will have to worry about assembling it on your own. No Running: This machine does not support those who want to run. The top speed is only four miles per hour. This is not as extensive as one would expect for a machine of this caliber. The good thing is that Bowflex provided a 100 percent guarantee on all of the equipment they offer. This machine is a welcome alternative to standard treadmills. This particular model only differs from the TC3000 in a few ways, including an elevation monitor, a wireless chest strap and a quick-start option. This may not be enough to warrant an additional $400 being added to the price. The biggest drawback is the fact that these machines cannot be used for running. The company thinks of this as an advantage since some people want to get a great workout without having to run.